Hospital Universitaire de la Paix, Port-au-Prince, Jan. 18, 2010. Cuba's rapid response to the 2010 earthquake, without troops to "protect" them from Haiti's poor, stands in sharp contrast to the dysfunctional and hostile American response, grounded in fear of "looters" and "rioters," prioritizing an illusory security over basic humanity. Cuba's long term plan in Haiti is to train Haitian doctors and medical personnel to work in their own country, a solid effort that has already produced hundreds of young doctors and avoids the racism and paternalism inherent in some mainstream aid efforts. The work of the Cubans and Haitians in the past week is described in these video feeds from CNN’s Shasta Darlington and Steve Kastenbaum. See also Emergency Earthquake Appeal: Support Cuban-Trained Haitian Doctors 1/21/2010 The Social Medicine Portal: "We have received an appeal from our friends at MEDICC who are providing support to Haitian doctors in Haiti who have been trained in Cuba. This is a particularly important effort since it strengthens the local medical infrastructure; these Haitian doctors will remain in place long after the disaster relief ends. And it also breaks with the mainly paternalistic (and subtly racist) presentation of Haitians as the passive recipients of help provided by outside agents." Presidente de Haití inicia visita a Cuba 12/3/2018 Cubadebate: "El presidente de Haití, Jovenel Moïse, inicia este lunes una visita oficial a Cuba que incluye conversaciones con autoridades cubanas y el homenaje al Héroe Nacional, José Martí, en el memorial que lleva su nombre en la Plaza de la Revolución capitalina. Moïse anunció en agosto último su intención de viajar a Cuba y visitar a los jóvenes de su país que cursan estudios en isla mayor de las Antillas. En esa ocasión, el mandatario agradeció la colaboración de Cuba al expresar que “la cooperación cubana, si no es la mejor, es una de las mejores”, y agregó que la Isla ha ayudado a Haití en todos los sectores." Presidente de Haití expresa intención de visitar Cuba 8/18/2018 Cubadebate: “Voy a ir donde ustedes, a Santiago de Cuba”, precisó el jefe de Estado durante el encuentro sostenido con 23 nuevos becarios, que en septiembre iniciarán el programa de estudios gratuito ofrecido por el gobierno cubano a naciones de escasos recursos. Los estudiantes comenzarán las carreras de medicina, ciencias farmacéuticas, telecomunicaciones, ingería civil y agrónoma y tecnología médica, para retornar al país e insertarse en la comunidades donde son necesarios." Understanding patterns of protest against Cuba’s medical internationalism 8/3/2018 London School of Economics: "The Haitian case follows the same pattern. Cubans arrived in 1998, following the devastation of Hurricane Georges, and have been providing healthcare across the county ever since. Cubans have provided approximately 75 per cent of rural health care, as well as training over 1,000 Haitian doctors at the University of Medical Sciences in Santiago de Cuba (known colloquially as “the Caribbean Faculty”) at no cost to the students or the Haitian government." Haiti - Cuba : Towards the Literacy of 300,000 more Haitians 6/7/2018 Haiti Libre: "Following a working meeting of Ministers of Education Pierre Josué Agénor Cadet (Haiti) and Ms. Ena Elsa Velazquez (Cuba) at the XI Annual Congress on Higher Education held in Havana in February 2018, around monitoring among other of projects in the field of literacy, the Cuban cooperation in Haiti, is preparing to literacy of a 300,000 additional Haitians." Haiti - Education : Cuba and Haiti are preparing the 7th literacy campaign 5/6/2016 Haiti Libre: "The Ambassador of Cuba in Haiti, Luis Castillo Campos held a working meeting with Mrs. Paulna Julien Brutus, Secretary of State for Literacy in Haiti, to which also participated Jorge Despaigne, head of the Cuban Brigade of Education in Haiti. During the meeting, the details have been finalized for the implementation of the 7th stage of the literacy campaign in Haiti and the decision to initiate this step in the department of Nippes (Southwest) was confirmed. Literacy work will be extended to 6 communes area of attention (Miragoâne, Anse-à-Veau and Baradères)." Cuba’s Medical Mission 2/15/2016 Monthly Review: "Though Cuba was in Haiti before the earthquake, provided the quickest and most professional emergency assistance, and remained long after the earthquake was history, Spain’s leading paper, El País, omitted Cuba from its list of countries that provided help. In the United States, a 2012 study by Harvard Medical School failed to mention Cuba’s contribution. Fox News actually criticized Cuba with the astounding claim that it failed to provide assistance. Meanwhile, the 22,000 Americans in Haiti were almost entirely military. Not only did U.S. doctors reach Haiti later and depart sooner than those from Cuba; they did not stay where Haitian victims huddled. After working hours, they tended to return to luxury hotels, while Cuban doctors lived in the communities of the Haitians they treated." Haiti - Environment : Cooperation Cuba-Haiti in the forestry sector 1/3/2016 Haiti Libre: "The Minister of the Environment, the engineer Dominique Pierre, held a working meeting with the Chargé d'Affaires of the Embassy of Cuba, Liliana Garcia Socarras around the development and continuity of the Cuban cooperation in the sector forest with his Ministry. During the meeting, the Minister stressed the importance of these exchanges through the Cuban experts in forestry, while four of them end their mission in Haiti." US, Cuban Doctors to Work Together in Haiti 9/18/2015 VOA: "A U.S. diplomat says his country and Cuba have a "historic opportunity" to work together to provide medical care for Haiti, still struggling to recover from a devastating 2010 earthquake that killed more than 200,000 people. Brian Shukan, deputy chief of mission at the U.S. embassy in Port-au-Prince, said Thursday that following the re-establishment of diplomatic ties between the U.S. and Cuba, the doctors of both countries could work together to help improve Haiti's dilapidated health care system." Haïti - Santé : Inauguration du nouvel hôpital Dr Raoul Pierre-Louis 6/12/2014 Haiti Libre: "Mercredi, dans le cadre de la coopération tripartite, Cuba-Brésil-Haïti, le Président Michel Martelly, en présence du Dr Florence D. Guillaume, la Ministre de la Santé, de Jude Machado Pierre, Maire de la commune, du Député de Carrefour, Elie Blaise, des Ambassadeurs en Haïti Ricardo Garcia Napoles (Cuba) et Jose Luis Machado E Costa (Brésil), a procédé à l’inauguration de l’Hôpital communautaire de référence, Dr Raoul Pierre-Louis situé à Arcachon 32 (Carrefour)." Consider a Cuba, Haiti, J'ca co-hub 1/27/2014 Jamaica Observer: "Taking into consideration these factors, the country's economic quagmire, and the possible development opportunities, a "trade-off" position is a co-hub between Cuba, Jamaica and Haiti. This approach would lessen the impact on Jamaica's environment. In Jamaica, the Vernam Field site should be developed, with a seaport and manufacturing zone in close proximity. The Goat Islands should be used for environmental protection and ecotourism." "Cuba no abandonará a Haití ni a su gobierno" 1/3/2014 Diario Libre: "Ambas naciones hemos tenido que pagar un alto precio por la audacia de enfrentar a los imperios dominantes", dijo Raúl, al tiempo de proclamar que reiteraba "al hermano pueblo haitiano y a su gobierno, que los cubanos jamás los abandonaremos, y que siempre podrán contar con nuestra modesta colaboración". "Cuba will not abandon Haiti..." says Castro 1/3/2014 Sentinel: "This statement, which led to the applause of several thousands of guests to the activity, occurred at a time in which Castro alluded to the date of the Haitian independence, also a first of January, which he said had a great impact in Cuba, noting that Haitian blood runs through the veins of many Cubans according to Diario Libre. "Both nations have had to pay a high price for daring to confront the dominant empires," Raul said, while reiterating proclaimed "brother, the Haitian people and their government, that the Cubans never wil abandon you, and always will have our modest contribution." ONU reconoce papel de médicos cubanos en Haití 4/2/2013 CubaDebate: "La secretaria general adjunta de la ONU, Rebeca Grynspan, dijo en Quito, la capital de Ecuador, que sin los médicos cubanos hubiera sido imposible dar una respuesta al cólera en Haití. La también administradora adjunta del Programa de las Naciones Unidas para el Desarrollo (PNUD), declaró que “de las cosas más esperanzadoras que vi en Haití fue la ayuda cubana y el aprecio del pueblo por los médicos cubanos”." Haiti - Health : 435 doctors trained in Cuba, in the Haitian health system 1/20/2013 Haiti Libre: "Recently, the Ministry of Health, in the presence of Dr. Florence D. Guillaume, the Minister of Health, Dr. Raymond Guirlaine, Director General, of Dr. Sinal Bertrand, President of the Health Commission of the Chamber of Deputies [one of the doctors of the first generation of Haitians trained in Medicine in Cuba], executives of the Embassy of Cuba whose the Vice-Dean of the Faculty : Dr. Medina Zoera and many other cadres of MSPP, welcomed the Haitian doctors trained in Cuba, that have integrated the Haitian Health. Today they are 435 [on 816] to be full members of the Ministry of Health working in different areas. Of 381 doctors not yet integrated, 160 are overseas and the Minister has promised to make every effort for the gradual integration of the remaining 221." Speech by Bruno Rodríguez Parilla, Cuban minister of foreign affairs, at the Haiti donors meeting 3/31/2010 Granma: "The international community has a tremendous debt with Haiti where, after three centuries of colonialism, the first social revolution on the American continent took place, an act of boldness that the colonial powers punished with close to 200 years of military dictatorships and plunder. Its noble and hardworking people are now the poorest in the Western hemisphere." Haiti-Séisme : La Norvège appui l’intervention des médecins cubains 1/26/2010 AlterPress: "La Norvège à mis à la disposition de Cuba cinq millions de couronnes (environ 885 000 dollars) pour soutenir le travail réalisé par les médecins cubains dans ce pays, indique la presse cubaine. Selon l’accord paraphé le 24 janvier, les fonds seront destinés à l’acquisition et à l’envoi de médicaments et d’autres matériels qui seront utilisés par la brigade Médicale Cubaine qui offre actuellement ses services aux victimes du séisme du 12 janvier." VIVA CUBA! 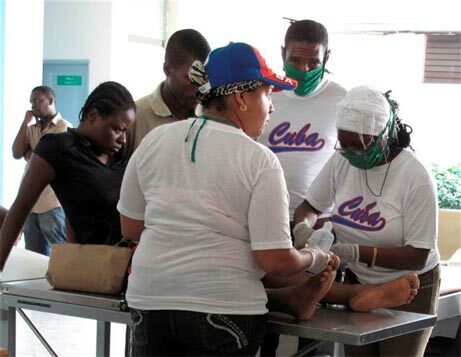 Cuban Doctors Treating the People of Haiti 1/24/2010 Haiti Cuba Venezuela Analysis: See pics - "Since the earthquake, Cuba has sent an additional 100 doctors and last year students at LASM sent a letter to Raul pleading to have the “honor” to go to Haiti to help. Cuba’s humanitarian assistance to the world began just a few years after the revolution when a Cuban boat dropped a load of arms to assist in the Algerian independence struggle. The boat returned with 76 injured Algerian guerillas along with 20 children from a refugee camp. During Guinea-Bissau’s war of independence from the Portuguese, Cuban ships regularly picked up the injured, which included many children, mostly orphans, and took them to Cuba for medical care and schooling. And since then, over 56,000 Cubans have worked in Africa as doctors, teachers, engineers, sports trainers and skilled workers. It has been said many times that “when Africa called, Cuba answered.” Now we must add, when Haiti called, Cuba answered a long time ago and continues its service to the people of Haiti." Cuba Aids Haiti Relief 1/22/2010 Voice of America: "President Barack Obama has pledged $100 million in aid to the ruined island nation, part of one of the largest international relief efforts in history. The bilateral cooperation between the U.S. and Cuba reflects our overwhelming concern for the welfare of the Haitian people. We will continue to look for areas where cooperation between our 2 nations can support Haitian relief." Cuba stands by the Haitian People 1/21/2010 Cuban Embassy, Botswana: "The Cuban doctors began to offer their services immediately after the earthquake. It was the most important health care assistance received by Haitian people in the first 72 hours. On 13 January, over 60 health staff joined those in to Port au Prince, including specialists from the Henry Reeve Contingent with experienced in emergencies when similar disasters occurred in Asia and Latin America countries. Until Thursday 14 January the Cuban Medical Brigade had assisted 1 987 patients and performed 111 surgeries, at health centers in Port au Prince: Field Hospital Annex, Hospital La Renaissance, Ofatma Hospital, Diagnostic Health Centers of Grand Goave and Integral Diagnostic Center Mirebalais, the latter two located on the outskirts of the capital." Emergency Earthquake Appeal: Support Cuban-Trained Haitian Doctors 1/21/2010 The Social Medicine Portal: "We have received an appeal from our friends at MEDICC who are providing support to Haitian doctors in Haiti who have been trained in Cuba. This is a particularly important effort since it strengthens the local medical infrastructure; these Haitian doctors will remain in place long after the disaster relief ends. And it also breaks with the mainly paternalistic (and subtly racist) presentation of Haitians as the passive recipients of help provided by outside agents." Emergency earthquake appeal: Support Cuban-trained Haitian doctors 1/20/2010 Progresso Weekly: "While U.S. law does not allow Cuban doctors in Haiti to receive these essential medical materials -- the U.S. embargo taking its toll post-disaster -- MEDICC and Global Links will ensure distribution to the young Haitian physicians working in public hospitals and clinics alongside the Cuban team, seeing hundreds of patients daily." The First Responders - The Blackout on Cuban Aid to Haiti 1/19/2010 CounterPunch: "The Christian Science Monitor, in a second article, quoted Laurence Korb, former assistant secretary of defense and now based at the Center for American Progress, as saying that the US, which is leading the relief efforts in Haiti, should “consider tapping the expertise of neighboring Cuba,” which he noted, “has some of the best doctors in the world--we should see about flying them in.” As for the rest of the US corporate media, they simply ignored Cuba. In fact, left unmentioned was the reality that Cuba already had nearly 400 doctors, EMTs and other medical personnel posted to Haiti to help with the day-to-day health needs of this poorest nation in the Americas, and that those professionals were the first to respond to the disaster, setting up a hospital right next to the main hospital in Port-au-Prince which collapsed in the earthquake, as well as a second tent-hospital elsewhere in the stricken city." U.S. and Cuba should work together to help Haiti 1/15/2010 CNN: "Shortly after, in October 2005, the Reeves Brigade was dispatched to help provide much-needed medical relief after the devastating Kashmir earthquake that tore through the Himalayan mountain region along Pakistan and Kashmir. The United States and Europe each sent teams of doctors to Pakistan, each with one base camp deployed for a month. The Cubans deployed seven major base camps and 30 field hospitals in the fundamentalist Islamic region of Pakistan, a nation with which Cuba did not have diplomatic relations at the time. Today, the Cubans and Pakistanis have embassies in each other's capitals. Bruno Rodriguez, the new foreign minister of Cuba, who was then the deputy, headed the mission and lived in Pakistan's rugged mountains for that full year. The Cuban medical teams reportedly worked constructively and positively with personnel from the U.S. and Europe -- and this kind of collaboration, even if informal, could be the kind of confidence-building narrative to move U.S.-Cuba relations out of the gridlock they have been in for decades." To Increase Help for Haiti, Obama Should Let U.S-Cuba Cooperation Take Flight 1/15/2010 Huffington Post: "According to Spanish press reports, this contingent is already providing emergency medical care across Haiti for patients that Cuban doctors had already been treating for many years. Immediately following the earthquake, these doctors opened up two make-shift clinics in their residences because local hospitals were destroyed. Cuban doctors then moved to reopen the "Social Security" hospital and started operating on the injured. A day ago, the Cubans reopened the national hospital and started to treat people. Their work could form the foundation for broad Cuban-U.S. cooperation. First, as U.S. AID and military teams roll into Haiti, the U.S. government should make it clear that our personnel should cooperate, coordinate, and work with the Cuban medical personnel in Haiti. They know Haiti, they've been providing health care in Haiti since 1998, and they have been running a highly effective medical response since the earthquake occurred." Henry Reeve Cuban Medical Brigade Serving in Haiti 1/15/2010 Juventud Rebelde: "Despite repeated aftershocks following the 7.2 earthquake that shook Haiti on Tuesday, a 60-member relief team of Cuban healthcare professionals is already providing medical assistance in that country. The team is part of the Henry Reeve emergency medical brigade, a contingent of Cuban doctors specializing in disaster situations and epidemics created by Fidel Castro to bring professional assistance to peoples in need in any corner of the world. In a catastrophe report published by the Cubadebate website, Cuban radio correspondent Isidro Fardales reports that this group of specialists brings the total number of Cuban doctors working in Haiti to 300, many of whom were sent to Puerto Principe in the aftermath of the earthquake." Haiti's plight can bind US and Cuba 1/14/2010 Guardian, UK: "Moving beyond the cold war stasis in US-Cuba relations is a priority of Barack Obama's administration, and the devastation in Haiti provides a platform to provide relief for a desperate nearby nation and build collaboration between Cuba and the US. Many great American voices from Brent Scowcroft and George Shultz to Jackson Browne and Bill Richardson have argued that the US-Cuba embargo makes no sense as foreign policy, that the right of Americans to travel anywhere in the world should not be suspended in the case of Cuba, that Cuba's exports of doctors rather than arms should be more than enough reason to strike Cuba off America's watch list of state sponsors of terror." Henry Reeve Cuban Medical Brigade in Haiti 1/14/2010 PL: "The medical brigade, which has experience in China, Pakistan, Guatemala, Indonesia and Bolivia, joined the rest of the health staff that was located there, which is helping citizens since the beginning of the tragedy. Cuban authorities sent medicines, saline solutions and blood serum, food and provisions as part of the solidarity aid." Cuba increases aid to Haiti 1/14/2010 Granma: "He said they had been able to confirm the status of all those working "within the city of Port-au-Prince. Only two of them received very slight injuries, and the others have confirmed that they are all right." "We are verifying the situation and gathering complete information about cooperative workers in other parts of the country. We have been able to locate the majority of them and they are fine," he assured. The minister added that victims have been receiving medical attention from the Cuban brigade since the earthquake struck. He noted that "they are now working in two campaign hospitals in our medical personnel’s accommodation facilities." He said that plans are underway to more emergency aid to the sister Caribbean nation, consisting of "a quantity of medicine and heath materials. An additional number of doctors are to travel there."" High death toll in Haiti 3/6/2004 The Age, Australia: "PAHO has supplied emergency generators to ten hospitals in the past few days, but staff has not returned and Cuban medics were attending emergency rooms, PAHO said. Cuba had sent around 500 medics to Haiti under an assistance agreement with Aristide's government, and most have agreed to stay on despite the violence, according to Cuban diplomatic sources in Washington." Protesters in Miami demand that Aristide step down 2/21/2004 Miami Herald: "The protest at Miami's Bayfront Park was coalition of Haitian, Venezuelan and Cuban groups that also demanded the ouster of Fidel Castro and President Hugo Chavez of Venezuela. Several speakers called Aristide, Castro and Chavez murderers and terrorists, their speeches peppered with comparisons to Osama bin Laden and Saddam Hussein. "Chavez must go. Aristide must go. And Castro must go," Haitian-born organizer Rubens Eliatus told the media as a crowd cheered."